We were a fluid group of about a dozen young women and men who came together in east London. We probably would have described ourselves as left libertarians. We organised in the community, in workplaces, around class, racism, women’s and men’s issues, for personal change/self-help therapy, and against bias in the media. We saw ourselves not as outside, but as part of these struggles, and saw the links between these different issues as embodying politics in everyday life. ‘Big Flame’ (www.bigflameuk.wordpress.com). Our projects carried on until the early 1980s, and after that we dispersed and took our ideas and values into different areas of work (teaching; architecture; psychotherapy; archaeology; local government; film-making; writing) as well as into continuing political and community activism. A Greek tragedy (on the Leninist fight against petit bourgeious violence in the revolution). Claire Berlinski at City Journal wonders why hardly anyone cares about the unread Soviet archives [via Michael Totten]. Ron Radosh responds. Berlinksi replies to him. Ron comes back again. Dave Graeber interview (original source here, with unreadable formatting). Vázquez Montalbán and the case against rationalism in philosophy and art. Gentrification in Baltimore and Barcelona. The Friends of Durruti: An Introduction by Conor McLoughlin (WSM). Like Nye Bevan, I hate the Tories. Important interview with Paul Berman by Michael Totten. 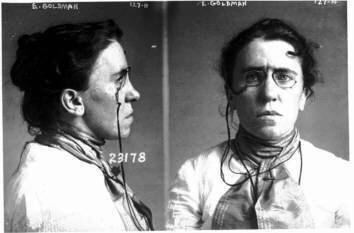 Subversive historian on the death of Emma Goldman. And on the Pullman strike. George Orwell in South London. Libertarian League: “What We Stand For” (1963). Social Revolutionary Anarchist Federation (SRAF) declaration (1972). Hakim Bey Joins the IWW (1991). Kronstadt and its revenges… an anarchist dissection of the corpse of Trotskyism today. Platypus: Review of Dave Renton’s Dissident Marxism. Platypus: Review of Perry’ Hubert Harrison: The Voice of Harlem Radicalism. Andrew Flood: Towards an anarchist history of the Chinese revolution. Paul LeBlanc: Marxism and revolutionary democracy (review of Simon Pirani and Soma Marik). Paul LeBlanc: Trotsky lives! (on Robert Service). Larry Gambone: Principled Bakuninism in Latin America. International Communist Tendency: Kronstadt 1921: The beginning of the counter-revolution. On Arthur Koestler: Christopher Hitchens, Louis Menand, Bernard Avishai, Christopher Caldwell. Iain McKay: anarchist-communist critique of mutualism. Libertarian communist forum in Moscow. Catalunya: Amadeu Casellas announces new hunger strike. Heather Gautney: Which Anarchism? Which Autonomism? Between Anarchism and Autonomist Marxism. Two long and interesting theory articles. What in the hell … is right and wrong with autonomist marxism? looks at Negri and other authonomists and their problematic axioms on historical materialism and inadequacy on the organisation question. (Here’s more on Hardt and Negri from the same source.) Trade unions, worker militancy, and communism from below by Property is Theft looks at the history of militant working class self-organization. Relevant to the latter issue are the next few items, mostly from Conatz, on anarcho-syndicalist and other forms of self-organization. Most relevant, from Argentina, a report on worker-run factories. The FAU itself is roughly the German equivalent of the American IWW. The FAU derives from a tradition that goes back to the decentralist unions of the late 1800s and early 1900s, which separated from the main centralist labor federation (predecessor of the present DGB) over the issue of local autonomy. After World War 1, the autonomous unions came together to form the Freie Arbeiter Union Deutchlands (FAUD). The FAUD was part of the radical grassroots unionism in Germany in the years immediately after World War 1. Famous German anarcho-syndicalists like Rudolph Rocker and Augustin Souchy participated in the FAUD in those years. In the late ’20s the FAUD had about 30,000 members. The FAUD was banned after the Nazis came to power in 1933, and many of its members ended up in concentration camps. Kersten, my Frankfurt FAU contact, told me that during World War 2, the German SS rounded up thousands of FAUD members and formed them into an armed battalion and stuck them out on the eastern front, facing the Red Army. An SS division was behind them, armed with machine guns. The FAUD people were told, “You fight the Russians or we kill you.” Few FAUD members survived to tell about that. In the late ’70s a new generation of German anarcho-syndicalists decided to rebuild the FAU. Also from the Turista, 2010 is the CNT’s centenary. The FASP is part of a tradition that has always been a majority in the libertarian camp, that of “social anarchism” or “anarchism of the masses”, which was responsible for the rise of certain phenomena of great importance such as revolutionary syndicalism. However, notwithstanding our belief in the need for anarchism to act within the popular movements – what some have called the “vectors of social anarchism” – we believe that in order to do this it is essential for there to be specific anarchist organization, a position that has not always been a majority one. This is, though, the position historically held, since the birth of anarchism, by Bakunin (Alliance of Socialist Democracy), Malatesta, and even Kropotkin at certain times, and also by the Russian anarchist communists of Delo Truda and the Federation of Anarchist Communists of Bulgaria (FAKB). In Latin America there have been important experiences such as the Junta of the Partido Liberal Mexicano, the Federación Anarquista Uruguaya and Resistência Libertária in Argentina. In Brazil, this mass tradition of social anarchism has existed for over 100 years, and was responsible for the union mobilizations that were so important in the early 20th century. It was comrades from this tradition who organized the Brazilian working class that started the struggle for gains such as the eight-hour working day. They inspired events such as the 1917 Strike, which had significant anarchist participation. With regard to specific anarchist organizations, there have been groups who tried to organize militants, but without much success, given that at that time, anarchism in Brazil – like elsewhere in the world – was hegemonised by syndicalist ideas, which did not deem the establishment of anarchist organizations important for work in the unions. 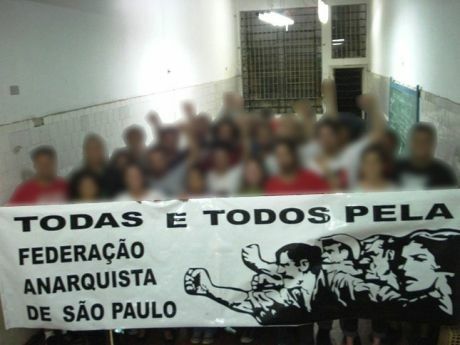 Examples of organizations of this type are the first Brazilian Communist Party (1919), the Anarchist Alliance of Rio de Janeiro and Sao Paulo groups that formed around newspapers at the time, and which supported differentiated levels of activity – the anarchist organization and the popular movements, known by some as “organizational dualism”. Previously on this topic: Libertarian socialism. My last post was on anarchist history, the one before on Marxist theory. This post links to some blog posts that try and think through the relationships between those two traditions. Many of these take as their starting point Staughton Lynd and Andrej Grubacic Wobblies and Zapatistas: Conversations on Anarchism, Marxism and Radical History (which you can buy here). Lady Poverty: Politics and class; Communists/Rudolf Rocker. Socialist Humanism with a human face: Towards socialism; Anarchism and Marxism. Eric Kerl, International Socialist Review: Debating how to change the world. Revol68, LibCom: Marxism and Anarchism. Upping the Anti: Wobblies and Zapatistas. Independent Working Class Association: Economic democracy – the need for a vision, part 1. Above the fold: American democratic socialists from archive.org and Russian anarchists from Libcom. Below the fold: links purloined from Ent, from assorted renegade Marxists and Third Campists. Browse the whole series here. *1905 Average Paid Membership by States, Socialist Party of America. *Ticket of the Socialist Party of Texas, 1906. *Socialist Party of America campaign book (1908). *Report of the Socialist Party of the United States to the International Congress at Copenhagen, 1910 – Hillquit, Morris,; 1869-1933; Berger, Victor L.,; 1860-1929; Barnes, J. Mahlon. *Armenian Revolutionary Federation Report in Socialist International Congress 1910. *Report of the Hungarian Socialist Federation to the National Committee of the Socialist Party of America, May 1913. *Patterson, Joseph Medill. The notebook of a neutral (1916). *Norman Thomas Socialist Party 1928 election platform. *Socialist Party-Social Democratic Federation. Socialist platform 1960. Budanov Avraam ( 1886? – 1928?1929?). A short biography of Avraam Budanov, who fought with the Makhnovists and continued an underground struggle after the defeat of the movement. Trofim Vdovichenko was born into a family of poor peasants in Novospasovka in the Ukraine. He received a primary education. From 1910 he was a member of the Novospasovka group of anarchist-communists, alongside Viktor Belash ,Vassily Kurilenko, Luca Bondarets, Filipp Goncharenko, Vladimir Protsenko and Fomenko who also all had leading roles in the Makhnovist movement later on. Alternative histories: Haile Selassie’s plea. Tragic presents: The coup in Honduras – Larry Gambone’s take, the Libertarian Communist Organization of Chile.